If you cracked open an acorn to look inside, what would you see? Certainly not a tree, that’s for sure. And yet, within that little capped orb is pure potential. The towering oak is implicit in the acorn, there but unexpressed until the circumstances of its unfolding are ripe to allow its potential to flourish, to be explicit. Nature takes care of that with sun, rain and soil. 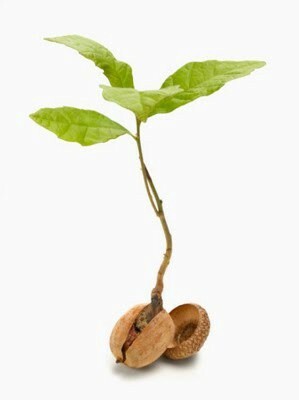 It is the nature of the acorn to become an oak, its destiny. It cannot become other than what it is. Your job on earth is being you. You, from the time you are born are becoming all you might be. Implicit within you are talents, strengths, weaknesses and propensities. However, a human being cannot rely on the pure support of nature to draw out his or her fullest potential. Baby humans are totally reliant on other humans for every need to survive, let alone flourish. Caregivers — parents or other influencers are a blend of beliefs and thoughts of what a child in its culture should be, generally, and what a child in the family should be, in particular. Is it ‘good for him’ to cry until he falls asleep? Should she be ‘allowed’ to write with her left hand? Which God should he obey? Should she be a lawyer or a painter? Should he be allowed to take ballet? This is the flurry of pruning that surrounds a fledgling child. But, what of that little acorn of a soul within the child? What about those veins of potential as invisible as the oak within the acorn, and yet as life defining? What if they’re not realised, or given expression? What of the shy little boy who, when he reaches up to write a word on the blackboard with his left hand, the teacher grabs the chalk from him, wraps his right hand fingers around it and slams his fist against the board in physical exclamation of her words, “I said your ‘good’ hand!” Or the equally insidious influence of the words lovingly spoken, “Don’t be silly, dear,” when the little girl shares a story of what she wants to be when she grows up. And what if we are not allowed to forge the right sort of nurturing relationships because someone is not from the right culture? The free flourishing of the seeds within a soul depends on the nurturing of the implicit — that which has yet to be expressed. These tender shoots are often stopped short when situations like the ones above stop a child in her tracks. Something that was meant to emerge into the light, like confidence in front of peers, or daring to dream has had a sudden halt. Not only the teacher’s abusive actions, but perhaps the derisive, if uncomfortable laughter from the children in the room sear this memory into the very body of the little boy. If the incident is not allowed to be expressed in a safe environment with an aware and understanding adult, or if the child keeps the embarrassing incident to himself, the body memory of that experience is deepened. This is when tendrils of the realised individual’s roots are reaching down into the soil of source or branching out into the world of experience. If stunted by trauma (and trauma is relative), these tentative potentialities not only get stunted, but claw us back from new learning experience going forward. These energies reach into the distant future if one day we find ourselves in front of a room of people about to speak and have the stomach clench we felt as a child. And why all this meander about acorns and oaks? It is this. Your pure potential lies within you right now. Your life expressed in this present moment may not look like a rocket scientist or a ballet dancer, but you can be sure that within you, quietly and patiently waiting for the sunshine of your attention and the rain of your belief and the soil of your intention, is the YOU, you are meant to be. Tendrils of who you really are will begin their tentative influence on your life. You may be familiar with them already through dreams, wishes and desires. If you are just exactly who you are, you can never get it wrong. No one can criticise or judge you because you are being a perfect expression of your whole potential. So what’s stopping you from being your brilliant shining Self? Someone else’s expectations? Perhaps, but in my experience these outer voices echo the ones inside our heads — informed by past stunted experience — that tell us we can’t or shouldn’t or it’s too risky, or we’ll make a fool of ourselves, or we’ll fail, so why begin? These ‘voices’ are often accompanied by feelings in the body; a tightening in the chest a clenching of the stomach. Instead of letting these inner feelings continue to block your full potential consider them alerts to the fact that something wants your attention. Your ‘wholeness’ wants expression. These fragments cut off by an experience, perhaps long since forgotten, can be accepted, put in context and integrated, thus taking you closer to wholeness — the oak unfolding, strong and resilient in root and branch. In this strength and resilience you learn to rely on the source energy of Creation — Life itself — to nurture being you and you choose the people in your life who are on the same quest of wholeness. They will see you in every phase of your life as a perfect Self in progress. And that is how you will know yourself. You know who you are and you know where you are going. You are the most perfect version of you that you can be in this moment — and in being you, you make the world a better place! Originally published at www.marilynharding.com on June 8, 2017.